Samford University's Cumberland School of Law dedicated its newly named Hare, Wynn, Newell & Newton Advanced Advocacy Courtroom Feb. 18. 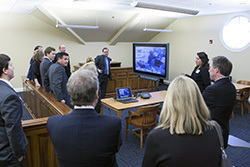 The facility made possible by the law firm Hare, Wynn, Newell & Newton ensures that Cumberland School of Law will be able to train students in one of the finest technologically advanced teaching courtrooms in the country. Cumberland School of Law prides itself on the high quality of its advocacy program, producing lawyers who are ready for practice, noted Cumberland Dean John L. Carroll. Over the past several years, a centerpiece of the law school's advocacy training has been the Advanced Trial Advocacy course. That course, limited to 12 students a semester, emphasizes the use of real-world skills and technology. The Hare, Wynn, Newell & Newton Advanced Advocacy Courtroom has become an important part of that course and the law school's overall advocacy program. At the dedication ceremony, Samford President Andrew Westmoreland thanked Hare Wynn for its generosity. Scott Powell, a partner at Hare Wynn and 1978 graduate of the law school, noted that the gift was in line with the vision of the founders of the Hare Wynn--Francis Hare, Sr., Carl Wynn, Neal Newell and Alex Newton--and their commitment to better the legal profession. Both Cumberland School of Law and Hare Wynn are nationally recognized for advocacy. In 2012, U.S. News & World Report ranked Cumberland School of Law fourth among all U.S. law schools in trial advocacy education. In 2011, Hare Wynn was recognized by the National Law Journal on its "Plaintiffs' Hot List." For this list, the National Law Journal asks its readers to identify law firms in the United States that have "done exemplary, cutting-edge work on the plaintiffs' side." Judge Joel Dubina, chief judge of the U.S. Court of Appeals for the Eleventh Circuit and a 1973 Cumberland graduate, was the featured speaker. He explained how he had seen technology in courtrooms change over the past 40 years, and stated that the bench is "dependent on ethical and highly trained lawyers." He thanked Hare Wynn for investing in the next generation of lawyers. Professor Deborah Young, director of Cumberland School of Law's Center for Advocacy and Clinical Education and former assistant U.S. Attorney for the District of Columbia, also spoke. As a teacher of the Advanced Trial Advocacy course, she said she has the best job of all, watching "each student master legal skills as the semester goes on."